Radical leftists are taking direct action to create a border-less world and a multicultural Europe by handing out bolt-cutters to the tens of thousands of migrants presently stuck in Greece. A leaked confidential government document from Austria’s crisis unit has revealed the behaviour of so-called, self declared “anarchists” in Greece, who are actively working to undermine the rule of law and trigger the collapse of European border control. Recounting the confessions of a group of over 100 illegals who somehow managed to penetrate the border into Macedonia the paper reports the migrants claimed to have been given a number of bolt cutters by either “an NGO [non governmental organisation] or activist group”. Seen by Austria’s Krone newspaper, the document outlines how the number of migrants travelling north had been dramatically reduced, a “maximum of 500 persons per 24 hours to the Croatian border”, and down to 450 a day by the end of last month. Preventing build-up in their own borders, each of the countries on the Balkan route were “repeatedly” sending migrants back to their southern neighbours. Upset that national governments had started to enforce their borders, it reported that certain groups had taken actions to fight back. 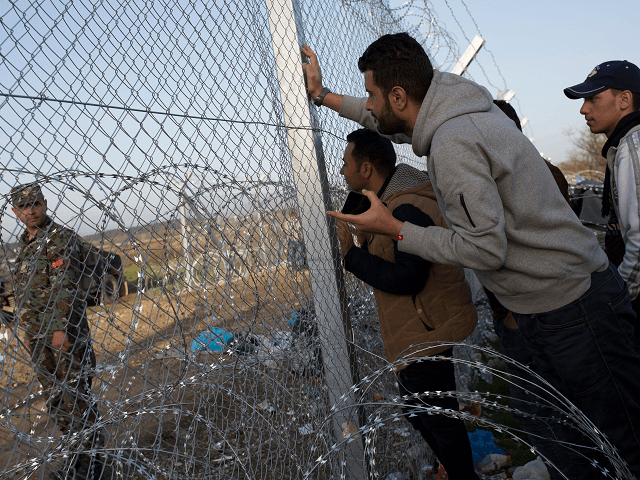 The paper stated: “An NGO or activist group on the [Greek border] is spreading bolt cutters to refugees in order to cut through the border fence. Tonight 104 detainees cut the fence at the green border. “Some 100 migrants were able to penetrate into Macedonia after they cut the green border fence”. The paper postulated the theory that the bolt cutter distribution coincided with a European-wide day of anti-border protests organised under the Twitter-hashtag ‘#SafePassage‘. Helsinki, demo for #SafePassage today. On the Greek side of the border, so-called #SafePassage “anarchists” were “active in the border region”, and had “actively advised migrants to cut the fence with bolt cutters”, it said. Breitbart London has reported at length on the criminal activity of no-borders campaigners, who have also taken up permanent residence in Calais at the migrant ‘Jungle’ camp there. A report in January outlined how Calais had been turned into a lawless border town by the presence of the radical leftists, who fanned the flames of migrant violence and assisted them in breaking into the Channel Tunnel terminal to access the United Kingdom. Perhaps unsurprisingly, the groups have proven to be remarkably shy of publicity and even declared parts of the town a “journalist free space”.